What is it with Department Stores and Yellow Ringtop fountain pens? In my post of January 16, 2012 , I restored and discussed a yellow ringtop with the Buettell (Dubuque, IA) imprint on it. Buettell was a Store in Dubuque and this pen has the Filene’s imprint. More on Filene’s later. As with many vintage yellow flat tops that were used, old ink is a staining problem that is difficult to deal with. As you can see below, this pen was no exception. I performed all the usual cleaning and repair steps on this one. The plastic barrel and cap are of fairly cheap quality and remind me of the Townsend pen that I restored back on October 12, 2011. I spent a lot of time on the barrel threads. As I have mentioned before, I find that a toothbrush works well with some kind of ink remover such as Ink Nix. I removed all of the old sac and replaced it with a trimmed size 16. The nib was cleaned in an ultrasonic cleaner and finished off with a jewelers cloth. The barrel and cap outsides were gently cleaned with scratch remover and polish. The inside of the cap was caked with old ink and I cleaned it in the ultrasonic cleaner and then with qtips and water. Ever after all of the ink was removed, you can see below that the cap is permanently stained as the old ink has altered the yellow plastic. I finished up by cleaning the section and feed and reinserting the nib. Finally, I attached a shortened size 16 sac to the section/feed/nib and inserted it into the barrel. The pen measures 4 5/8 inches closed and 6 inches capped. Here is a closeup of the barrel imprint – FILENE’S. Filene’s was a department store that was started in Boston in the late 1800s and built their flagship store there in 1912. The famous retailer continued in operation until the early 21st century. The nib, which I am thinking is not original to the pen, is a Wahl Eversharp Signature 2, and in very nice condition. I am uncertain as to its originality because I do not think this would be a Wahl product. I do not know who did make it, but Wahl would not be on the top of my list. The nib, which has been in the pen for a while, is a nice addition, however. Here are my two “department store” pens together. The top pen is this Filene’s pens and the bottom is the Dubuque, IA Buettell Brothers Pen. I would be interested to know if these were provided to employees to use in the stores (the ringtop would make it easier to wear carry and use), or as gifts. Yellow would certainly make them stand out! As mentioned in the Buettell article, I would place these in the 1930s range of production, based on the style. Certainly, Filene’s was a vibrant retailer in Boston at that time. I would be interested to hear if anyone has any other large retail store logo pens from this time period. An interesting subset of the fountain pen world, to be sure…..
Every once in a while, a pen comes along that fits in with what you collect (Midwest/Vintage) that is a bit of a mystery. This pen is not much of one, but its Midwestern imprint prompted me to pick it up. I am not a big fan of ring top pens, but the Dubuque, Iowa roots of the pen, overcame that. Below is the pen after I took it apart. The lever is a hanging one, and in good shape, so I left it in. You can see that the main concern is the dirty yellow barrel and cap, and need of a new sac. I spent a considerable amount of time cleaning the barrel and cap, both inside and out. The hardest part was the inside of the cap. The yellow cap and inner cap were caked with old blue ink and it took numerous trips to the ultrasonic cleaner and swabs with q tips to finish that job. As you can see, the pen is now very clean. The threads cleaned up with a toothbrush and ink nix. I polished the nib on both sides. It is a very nice Warranted 14K, with a triangle logo. The pen measures 4 3/4 inches closed and 5 1/2 inches posted. A brief search of Ruettell Brothers in Dubuque came up empty. There were Ruettell Brothers Clothing Stores in Crookston, Minnesota, and Grand Forks, North Dakota throughout the 1900s, and certainly during the time of this pen. My only guess is that they opened a location in Dubuque in the 1920s or 30s and used these as promotional, sales, or employee pens. I will continue to research the connection, but nothing comes up yet. 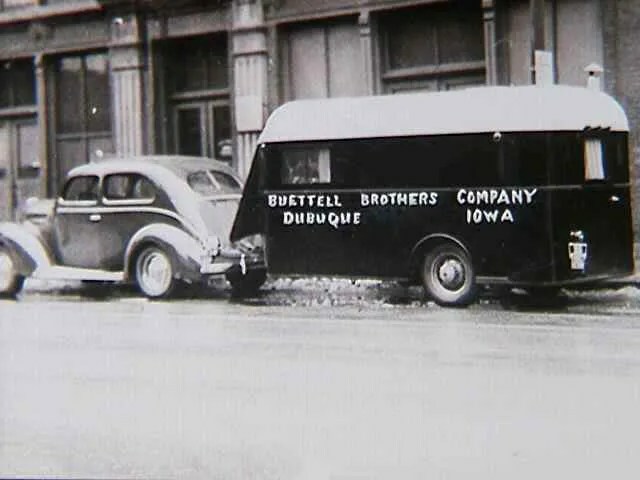 It appears that Buettell Brothers was a long standing business in Dubuque. A quick Google Search shows that they were also a publisher of Post Cards for years as well, and had a large Office Building for years in the downtown area of Dubuque. Mike’s information certainly puts this 1920s/30s pen in better perspective, as they were a very active business at this time and thereafter. 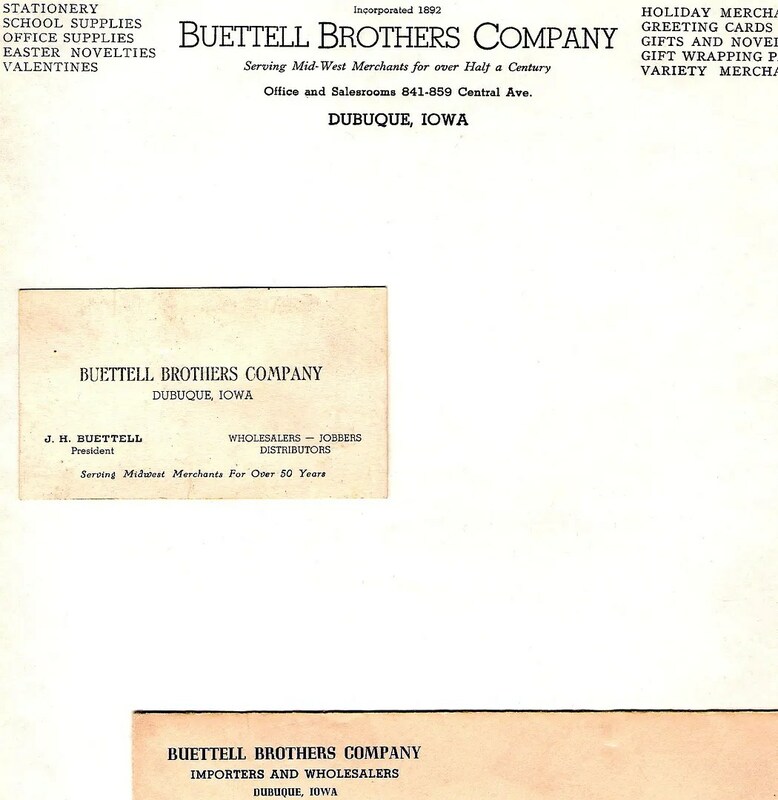 “BUETTELL BROTHERS COMPANY. 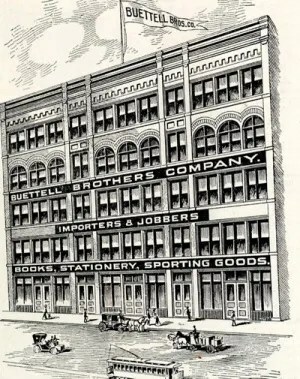 One of the cities largest importers and wholesalers in 1911, Buettell Brothers Company was established and incorporated in 1892. Located at 819-859 Clay Street, it was the only exclusive wholesale stationery house In Iowa. Officers in the company included E. A. Buettell, President; W.A. Buettell, Vice President; and A. C. Buettell, Secretary and Treasurer. I admit that I am drawn to looking at the cap and barrel ends and they make me think of some National Pen Products pens from the 20s and 30s. Perhaps they produced these for Buettell – Chicago is not far away…. I have been to Dubuque a few times, and it is a beautiful city on the Mississippi River in Eastern Iowa, across the River from Illinois. On my next visit I will have to look for a few more of these…. Edit 8-18-12: I received a very nice email and set of photos of the home of A.E. Buettell, one of the Buettell Brothers, from 1908 (below). 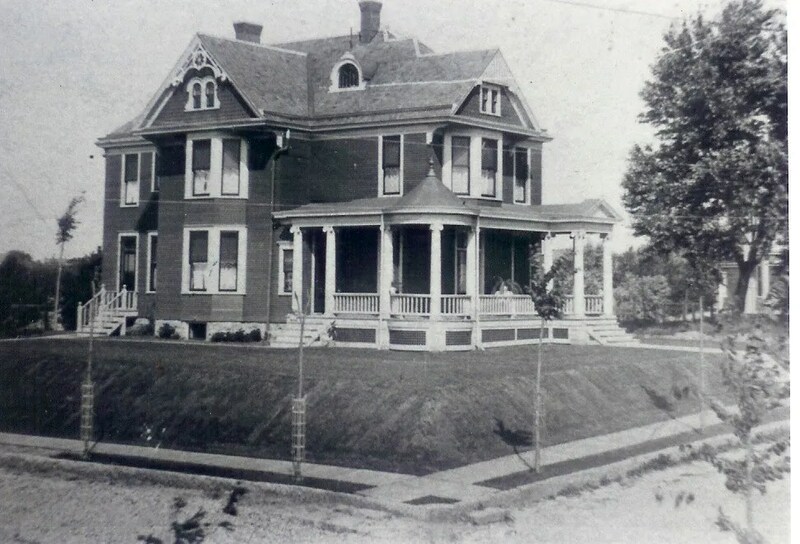 The photo comes courtesy of Mr. Bill Stoffel, current resident of the home in Dubuque, who is restoring the home. 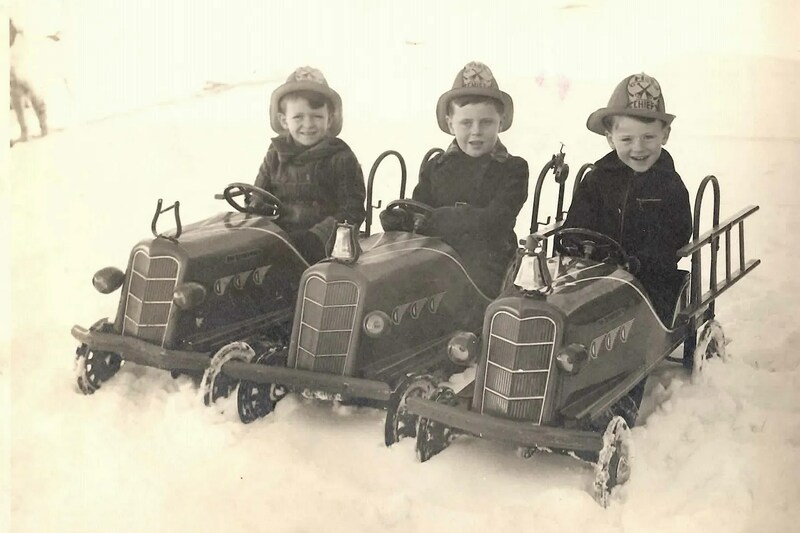 The Buettell Brothers are described above. Thank you very much for this photo, taken a few years prior to the production of this fountain pen, and during the prosperous years of their business in Dubuque. 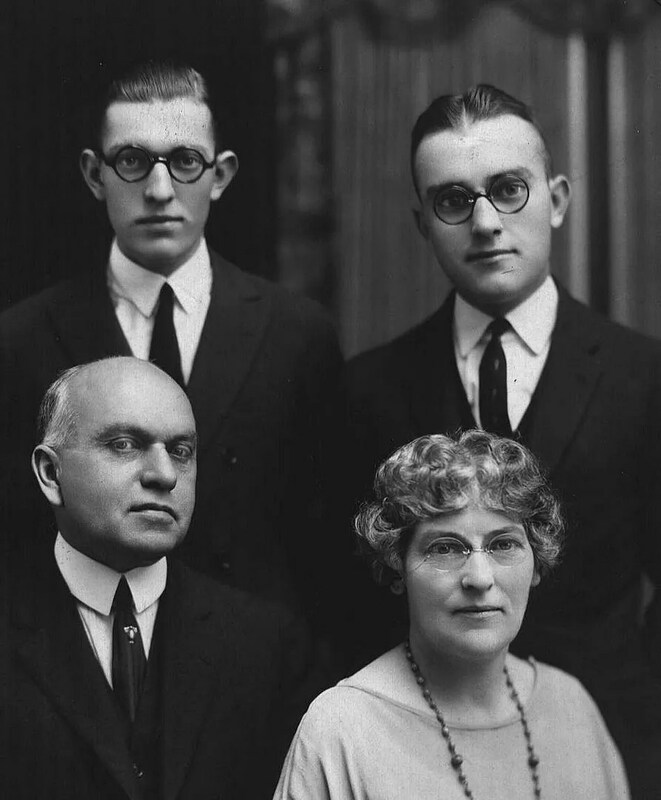 E.A., wife Millie, and sons John Haines (Bibs) and Andrew Kopp. 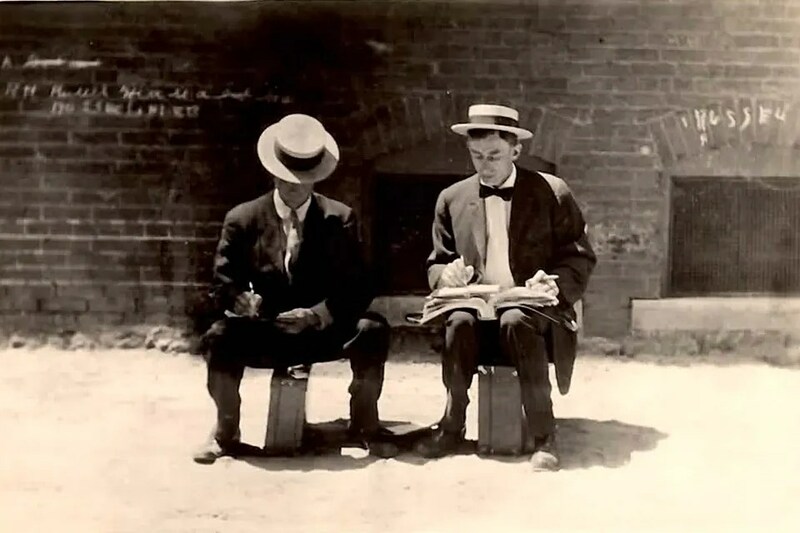 Salesmen filling out orders – wish we had a closeup of the pens…. Who knew that a small yellow ringtop fountain pen would lead to such great information on a proud family business spanning almost 60 years in Dubuque, Iowa. Thank you to Teran for sharing this very interesting family history!